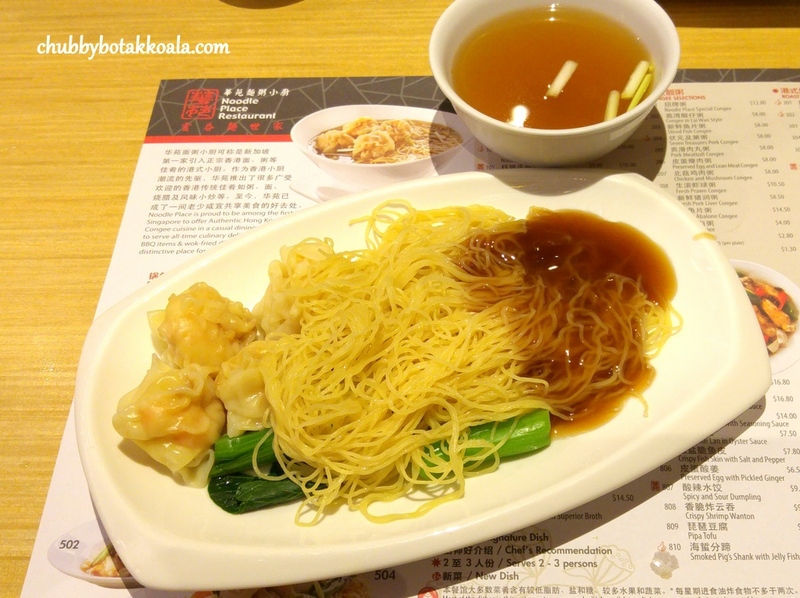 One of the must-try food when you go to Hong Kong is Wanton Mee. Though we have our own version of wanton mee in Singapore, the one in that we normally eat in Hong Kong is different. 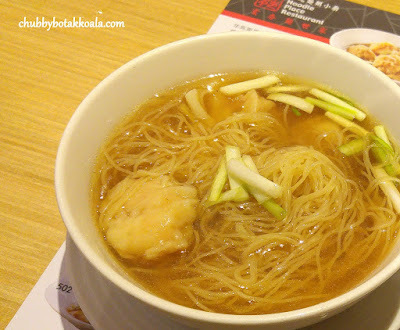 The Hong Kong version of wanton mee normally come in clear soupy version. The noodle is thin, springy almost feel like you are biting wires. Fresh, crunchy shrimp wanton which are filled with fragrant sesame oil topped with chopped yellow chives and a robust broth. Recently we found a pretty good place for Hong Kong style of wanton mee in Orchard Road, called Noodle Place. With a little digging, I found out that it was actually owned by PFS Pte Ltd, the food service arm of Prima Group. Apparently, they engaged Chef Chui Chuen Lai, former Executive Chef of Mak's Noodle in Hong Kong as Head Consultant to give Noodle Place the authentic Hong Kong dining experience. We ordered the Shrimp Wanton Noodle ($8.30 for soup & $9 for dry). The soup version come in a bigger bowl compare those we had in Hong Kong. The size of the congee bowl. The broth was golden in colour and from the first sip, you can actually taste the robustness of the broth infused with prawn and pork. The noodle was thin and springy (QQ), but it still has enough pores to absorb the beautiful broth. The four pieces of wanton were fresh, crunchy and cover with the fragrance of the sesame oil. 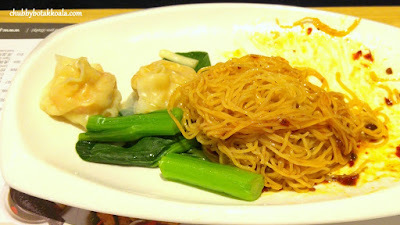 Also watch out for the yellow chives that add the subtle flavour in the wanton mee. Definitely feels like we are eating the wanton mee in Hong Kong. The wanton was so good, LD actually order another wanton soup. For the dry version, it is served in typical simple, no frills Hong Kong fashion. Dry noodle, 4 pcs of wanton, a few pieces of kai lan and a good dollop of superior oyster sauce. Though the noodle and wanton are the same, the superior oyster sauce can't compete with the superior broth. 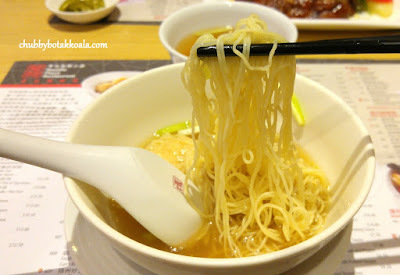 If you prefer the dry version, my suggestion is order the soup version, ask for extra plate and dry the noodle yourself. This is definitely the way to eat here. To accompany our noodles, we decided to try Twin Mixed Roast Meat – Crispy Roast Pork and Roast Duck ($19). The roast duck is juicy and succulent, while the skin was crispy and beautifully peel off from the meat. It's a bit fatty, but I just love how it melts in your mouth. Oh No... Now I am drooling for the roast duck. The roast pork is more on the fat side, flavourful, nicely marinated, however missing the crunchiness from the crackling. It seems the skin was being soaked too much in its oil. The décor of the place is very simple, no much fuss about it. It is bright and although they try to maximise the seating area, there is sufficient space between tables. 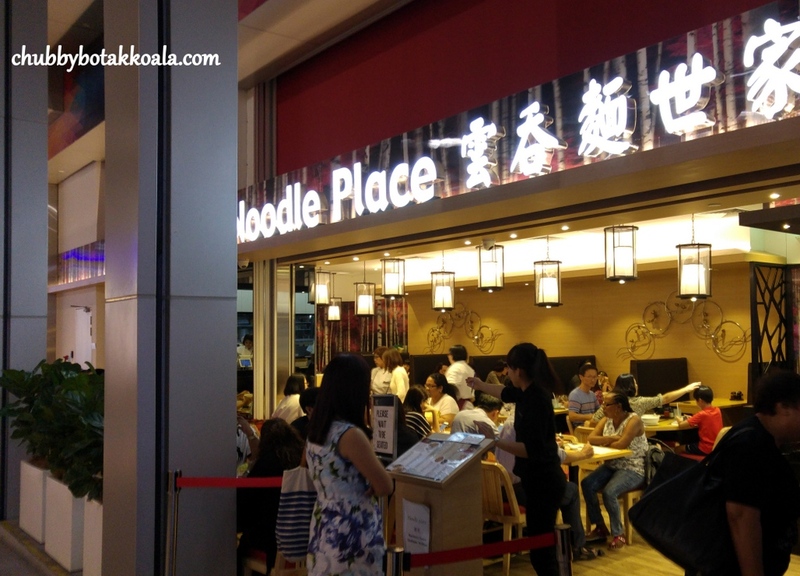 Overall, Noodle Place is definitely one of the place I will go to satisfy my Hong Kong Wanton mee cravings. Of course I don't mind a good plate of roast pork and roast duck as well. Cheers! !